Martin Gray in old age. Throughout his life as an entrepreneur, he wrote a number of books, but his most famous one was written by someone else. *Note: Surlievor = a survivor who lies about what he/she survived. In honor of Yom Ha'shoah on this May 5, 2016, MSN News runs a story they picked up from the Mail&Guardian, a British South African newspaper, titled “Holocaust a grim reminder of dangers of allowing racial hatred to run wild.” The key words in that title are “racial hatred.” This is the message the Jews are trying very, very hard to establish as a “problem” for the entire Western world. And of course, for them it all goes back to persecution of Jews which over time led to “the Holocaust.” A tidy story we're all familiar with. But pay attention! It's the expression of racial hatred that is the problem. Because, of course you can't stop people from disliking other people, but they can be stopped from expressing that dislike. This is what was enforced in the Soviet Union after the Russian revolution in 1917 and again in defeated Germany after 1945. Jews, especially, have to be protected since, as a race, they work against the interests of the national people in whatever country they're in, and thus are highly disliked. The release of Eric Hunt's new Holocaust revisionist film “Questioning The Holocaust: Why We Believed, Part 1” has brought to the fore some disagreements within the revisionist community. Nothing too unusual because they've always been there, but interestingly, it spills over, just by chance, to include the Alt-Right community too. What I'm speaking of is revisionist Michael Hoffman's complaint to and about Eric Hunt, and also Kevin MacDonald's recent article posted at The Occidental Observer titled, “Northern Europeans less prone to “blaming the other.” These separate items come together in the question of “Who is to blame” for the problems facing White European peoples in the 21st century. When it comes to the “Holocaust”, the so-called Alternative Right de facto position (wherein I place Kevin MacDonald) is that Hitler was responsible and all we can do is admit it and move on. It does no good to waste any time on it. Filmmaker Eric Hunt has released his latest documentary film today, Monday, April 25, on a new website: Questioning The Holocaust.com. It is the first in a series that will appear under that heading. I would describe this film as a basic primer with the intention of reaching those who were indoctrinated with Holocaust education throughout their school years, and may have had some questions they were afraid to ask. Now they can learn about it from a different perspective and get some answers that weren't available to them in their school setting. The film is appropriately named Questioning "The Holocaust" - Why We Believed. It is Part 1 of 2, with the second part coming at a later date. Part 1 focuses on that very question of why we all started out believing, even swallowing the popular conception of "fake shower rooms" into which Jews were allegedly lured only to experience deadly hydrogen-cyanide gas coming out of the shower heads instead of water. That explains the neat graphic of the shower head attached to a pipe in the shape of a question mark. Of course, if the gas killed them all, who was there to tell such a story? Well, there are "survivors" who said they "escaped from the gas chamber" but it was really a rumor that circulated among the inmates in several camps - and we learn how this rumor became a belief. Paul Argiewicz proudly shows off his Auschwitz tattoo which is his best proof he is a holocaust survivor. But it’s the details of his story that are suspect, as is true of all surliever stories. 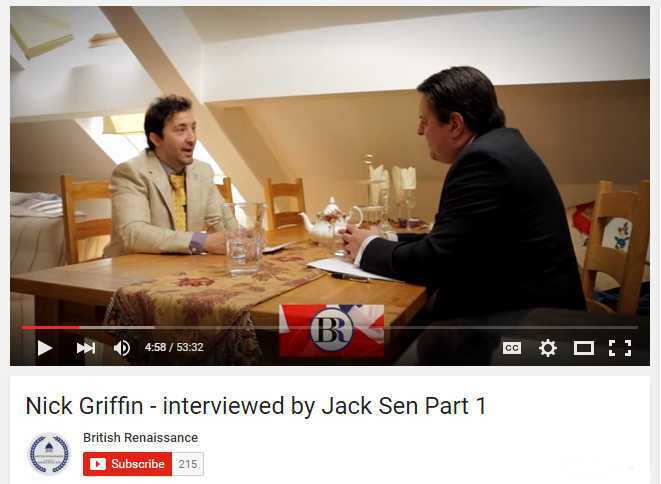 I RECENTLY WATCHED the new video interview: “Nick Griffin interview with Jack Sen – Part 1.” There are three parts, all available now, although I have only watched Part 1, which I came upon posted at The Occidental Observer (TOO). Skimming through it, I was struck by the conversation between the two men about Holocaust, so later I settled down to watch all of Part 1. For background, Jack Sen is a British citizen who is one-half East Indian** and has written four articles for TOO to date, his latest being an attack on the Dresden, Germany-based PEGIDA, calling it a Zionist organization. According to his article, Sen got involved with the PEGIDA-UK Facebook page editors and watched them cave in to Jewish money, thus has created an organization of his own he named “British Renaissance.” Interesting that his BR logo was designed for free by the PEGIDA-UK webmaster before he left. I was put-off by this article for the reason that it was the second anti-Pegida essay published at TOO that I have read – the first being an attack on Tommy Robinson and Pegida-UK by another Britain-booster and regular contributor, Francis Carr Begbie. My impression of Begbie is that he never met a German that he liked. In this article he claimed that an Israeli flag was prominently displayed at every PEGIDA rally – absolutely false! I've never seen one and I watch them all. So when either of these two men write about Germany, it's clear to me they just don't have a clue and should stick to something they actually know about. Thomas Dalton has done it again! Not only has he just published an exceptional article about Mein Kampf and Adolf Hitler, but Dalton reveals he is also working on a new English translation of Mein Kampf – a side-by-side German-English translation, no less! This is fantastic news. I think he had better make a big first print run when he publishes it because it will no doubt be highly desirable. He may become the first revisionist author to get rich on his work! Everything Dalton has done to date has been outstanding, in my opinion. He is one of those writers who seems to want to truly enlighten his readers, so he puts the facts of the story first and gets himself out of the way. For this reason, and others, he is perfectly suited to do a new Mein Kampf translation we can have faith in. The first revisionist work I know by Dalton is the well-known Debating the Holocaust: A New Look At Both Sides” (2009), which contrasts the “exterminationist” and the revisionist views in an impartial and thorough manner. The book was very successful, as holocaust revisionist books go. Read more about Thomas Dalton has done it again! 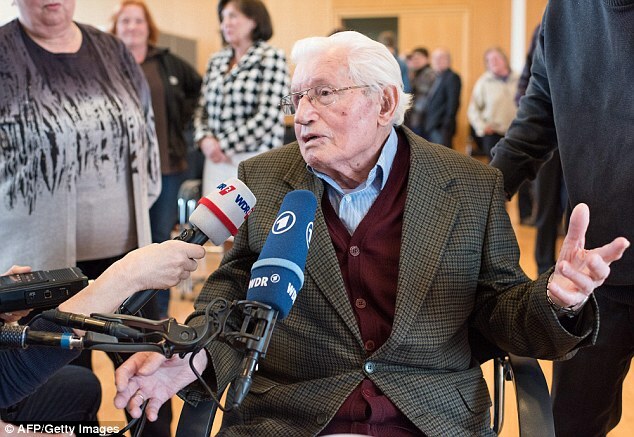 Jakob Wendel speaks with reporters in the courtroom where he is testifying against Reinhold Hanning for the murder of 170,000 Jews. I couldn't discover whether he is a Jew but it's certainly possible. ON FRIDAY, March 11, a 92 year-old professional liar-witness named Jakob Wendel (ethnic roots uncertain) testified in a German court to things that cannot possibly be true. 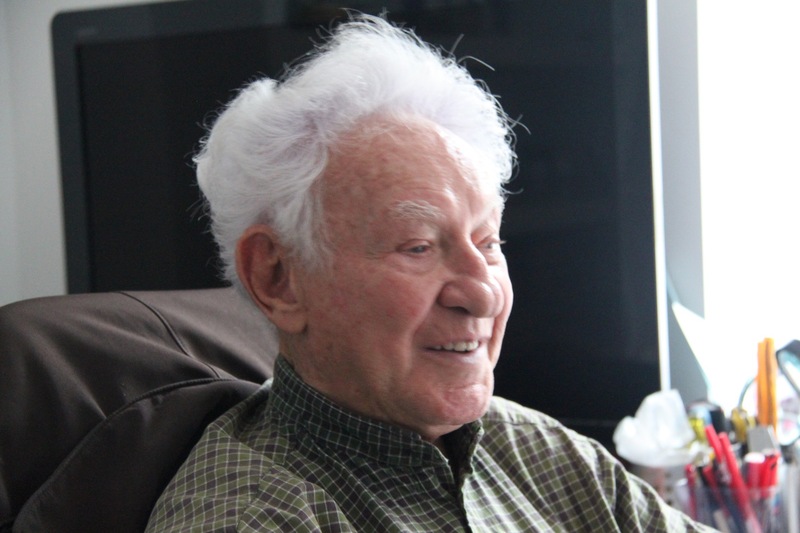 He said that defendant Reinhold Hanning had to have known that Auschwitz was an “extermination camp” because “I was there for two years (1942-44) and anyone who was there for that length of time knew what was happening there.” Wendel and Hanning were both SS guards at the camp but had never crossed paths. Weber: "My view about the gas-chambers or gassings is the same essentially as David Irving. And I believe that Jews were gassed. Yes." In the first part, I showed that Mark Weber, in his interview with Jim Rizoli (10 February 2016), consistently tried to avoid acknowledging any findings of Holocaust Revisionism, and also tried to conceal his past acknowledgment of such findings. In this part, the focus is on Weber's attempts to justify his retreat from Holocaust Revisionism. 1. The question of whether the Holocaust-story is true or false is no longer relevant. 2. Although the truth about the Holocaust is relevant (contradicting the previous point) it should not be relevant! 3. There is no point in disputing the Holocaust because Jews really were gassed.